A look into the history of the Hi-Point® brand helps to explain why these firearms are loved by so many. The main objective for Hi-Point® since the beginning was to build ”blue-collar” guns, which we now refer to often as The Working Man’s Gun. Our goal was never to make a cheap gun, but to make a good gun and sell it cheap—a gun that could be loved and used by many, despite their economic fortitude. And that’s exactly what we are doing. You can follow along with our story here! Interested in learning about our widely-loved guns? Well then, read on! Hi-Point® Firearms offers affordably priced semi-automatic handguns in a wide range of the most in-demand calibers. Our firearms are highly popular with recreational target shooters, hunters, campers, law enforcement, and anyone else seeking an affordable, reliable, American-made firearm. Below is a breakdown of our handgun models and specs. All of our Hi-Point® Firearm handguns feature 100% American parts and assembly. They are +P ammunition rated (rare among inexpensive guns!) and built with high-impact polymer frames and grips. They have 3-dot, fully adjustable sights, as well as a free extra rear ghost ring sight. Each handgun features a durable, attractive, easy-grip finish. They also have a last round hold open, a free trigger lock, a magazine disconnect safety, and a quick on/off thumb safety. All of our handguns and carbines come with detailed operations and safety manual, as well as our acclaimed Lifetime Warranty. At Hi-Point, we offer semi-automatic carbines that meet a variety of shooting needs. Featuring a 995 (9mm), 1095 (10mm), 3895 (380 ACP), 4095 (40 S&W), and 4595 (45 ACP)—we have whatever you need to achieve the shot you want. Whichever model you choose, rest assured that you are purchasing a reliable and accurate firearm at a price you can afford. Our hand-built carbines are +P rated and accept most factory ammunition. The Hi-Point carbine models offer countless add-ons and feature solid builds while maintaining natural feel and weight. Supplying firearms to hunters, law enforcement officers, recreational shooters, and those simply looking for additional home security, we maintain our commitment to gun safety without skimping on quality & design. Below is a breakdown of our carbine models and specs. All of our Hi-Point® Firearm carbines feature American parts and assembly. They are +P rated to accept most factory ammunition and built with all-weather, polymer skeletonized stock. They are built with an internal recoil buffer and some models come standard with threaded barrels. Built with fully adjustable sights, they feature a flat black receiver shroud, quick on/off thumb safety and a grip-mounted magazine release. All carbines come with a 10-round magazine, except the 4595 (45 ACP), which comes with a 9-round magazine. With free trigger locks and weaver style rails, our carbines are well-known and trusted. Damage, age, and plain old wear and tear—it just happens. When it does, our customers learn quickly that we are truly different from the rest. And “lifetime” means just that. 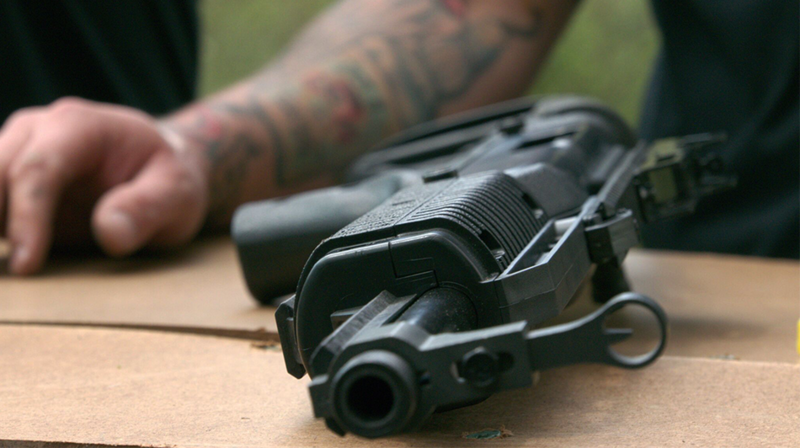 We proudly provide repairs for the life of the gun, whether you are the first owner or the third. Some restrictions may apply. Please call for more information on warranty service. (419) 747-9444. Click here to find a Hi-Point® dealer near you!